You might not have realized how big the Philadelphia craft beer scene has become. It’s always been a boozy city, but as the craft beer movement has grown large and strong in the U.S., Philadelphia has firmly planted itself as one of the nation’s top cities for microbreweries. Of course, that means a craft beer trail has formed in Philadelphia. In this post, you will learn about 5 of the best beer bars in Philadelphia for craft beer. Beer tourism is alive and well in Philadelphia, so you’ll have no trouble finding craft breweries to visit and tour. You can put together your own beer trail from a list of some of the top breweries, or you can let the experts take you to their favorites on this beer tour, which visits 4 of the most popular craft breweries in Philly. And when you get hungry from all this beer drinking, be sure to check out our Philadelphia food crawl, as well. ⇒ Since there are a bunch of breweries and pubs to visit within the city center, you might want to stay at a hotel in downtown Philadelphia, and then walk or take a cab from place to place. We like the Philadelphia Marriott Downtown, but you can check the full range of affordable luxury hotels in Philly here. Neshaminy Creek has dominated the Philadelphia beer world by taking home a few top Philly Beer Scene awards for three years in a row, including best brewery and best brewer of the year. They have a wide selection of beers including a lager, pilsner, a couple IPAs and a cream ale. The brewery is in Croydon, about 18 miles northeast of the city. You can reach the brewery via public transit since it’s on the Trenton line. Neshaminy Creek is open Wednesday to Sunday, and you’ll often find food trucks parked outside. You can now also check out their Borough Brewhouse, their home and brewpub in Jenkintown, that has a full beer and food menu, and lots of space for large groups in a modern facility. At Tired Hands Brewing Company, you’ll find farmhouse-style ales like those from France and Belgium, alongside hoppy Northwest-style IPAs, using ingredients that are as locally sourced as possible. The owner’s passion for beer began as a homebrewing hobby, where some experimentation with brewing farmhouse style beers took place. With a few homebrew awards under his belt, he took on brewing as a profession and eventually aspired to open his own brew pub. There are two neighboring locations in Ardmore, where visitors can try the many beers on tap. At the Brew Cafe, you can pair your brews with light snacks like meats and cheeses. At the Fermentaria, enjoy bigger plates like tacos and ceviche with your freshly brewed beer. You don’t have to leave downtown to try the craft beer at 2nd Story Brewing Company, which is located just a few blocks away from Independence Hall on Chestnut Street. The brew pub earned its name in two ways. As the owners say, everyone has a first story they tell people who ask about them – who they are, where they’re from, etc. But it’s their second story that matters the most, being their passion and what they love to do. Additionally, the brewing operation is located on the second story of their building on Chestnut St.
At 2nd Story Brewing, there’s a brew pub on the bottom floor, and the brewing takes place on the second story. You can stop in during open hours to enjoy a pint with a meal – be sure to order the brisket poutine! There’s a beer style for everyone, from IPA to lager and stout. It’s often very busy, so be prepared. Stop by 2SP Brewing Company on a Saturday to take a tour of the facilities. The brewery gives tours at 1 p.m. and 2 p.m. The tasting room and brewery are located in Aston, about 20 miles southwest of the city. They focus on crafting interesting beers, which has a lot to do with their popularity. Be sure to try their Up & Out IPA, 2SPils and Baby Bob American stout. 2SP Brewing Company encourages patrons to bring food or stop by from Thursday through Saturday to catch one of the rotating food trucks. They also have a regularly occuring smores night. The brewery won the Best New Brewery of the Year award in 2017, as well as a best tasting room award. Located in the Cedar Park neighborhood of West Philadelphia, Dock Street Brewing Company has a bit of a different story and history than any of the others in this list. They stake their claim as being Philadelphia’s first microbrewery, established in 1985. They have a good 20 years of experience on the other relatively new Philadelphia craft breweries in our list. There’s a reason they’re the pioneers. You can visit their brewery (which is housed in a century-old firehouse that’s been converted into brewery) for a tour and tasting, or just to hang out with friends and enjoy a wood-fired pizza. They also have a separate bar right next to the brewery that serves other types of alcohol, along with their beer. These are just a few of the top craft breweries in Philadelphia to visit. You’ll find many more listed by location on VisitPhilly.com, along with opening hours and visitor information. What is your favorite Philly craft brewery? Share it with us in the comments. This entry was posted in Beer and tagged Philadelphia, USA. Delicious, thanks for the insight, we love craft beer! And Phili! As a German I don’t often say no to beer. ? I wish they had done this tour when I was in Phily years ago. I would have really enjoyed it I think. Yeah, it shows how quickly the beer scene is developing in Philly. In another couple years, I’m sure the numbers will have doubled. Beer is not a drink i really appreciate. I´m portuguese and here we have good beer too!!! But any way if i go go to Philadelphia i will drink one or two. It’s okay, Catarina! There’s plenty of other great things to enjoy in Philadelphia. I had no idea that Philadelphia had such a thriving micro brewery scene. Isn’t it wonderful how passionate the brewers are about their product! It is, isn’t it? I love to see the passion behind a product. I always appreciate a tour the brewery to really get a sense of the process. I think it makes a tasting or a beer flight really come alive when you understand the backstory. Philadelphia is soo close to NYC and I’ve wanted to get there again. I’ll have to keep these brewing companies in mind. When I lived in DC, I used to go up to Philly (and NYC) often just to try out the new food options. Seems like every neighborhood has something awesome to offer. You’re lucky to live so close to it all! I am not a beer fan… in fact I don’t take it. But then a tour through breweries would definitely interest me. The production of this beverage from different ingredients has always interested me. Beer definitely isn’t for everyone, but I do think the factory tours can still be quite interesting, just for the process. Great to know Philly has a solid craft beer scene. I’ll be visiting some friends out there sooner or later. Also thanks for the tip of 2nd Story Brewing being right downtown since that is where I’ll be staying. Megan, there are a few others downtown that are worth visiting, as well. It’s nice to be able to walk to them! This sounds fun. I’d like to do a craft brewery tour, just to learn more about the breweries. I’ve sampled a few craft breweries lately and found them fun and fascinating, not to mention thirst quenching. It’s definitely a trend that’s caught on. It certainly is, Carol. 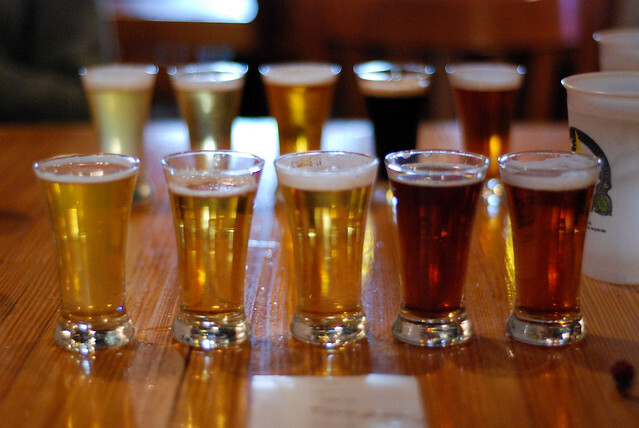 Brewery tours are a fun “adult” way to explore a city. While I have sampled local craft beer, I’ve never visited such a brewery (only bigger ones in the Czech Republic). i’d love to go on a tour of a few of them, and maybe sample their product. I’d like to go on a tour at a Czech brewery. We can swap!